Darnley Fine Art | Interior Boutiques – Antiques for sale and mid century modern furniture, french furniture, antique lighting, retro furniture and danish furniture. 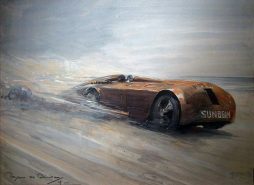 Darnley Fine Art holds an extensive stock of fine paintings from the 16th to the 20th Century. We are a leading specialist in 19th Century Orientalist paintings of the Middle East and prints by David Roberts. We also try to have a good selection of Portraits and are one of the only galleries that deals in original paintings for Railway Poster’s from the 1930′s. We have an extensive knowledge in these fields and advise clients on starting or adding to their collection, providing a detailed background to each artist’s work. Advice is also given on other important aspects of acquisition such as framing, hanging, insurance and the maintenance of works of art. We have sold works to museums and public institutions around the world. 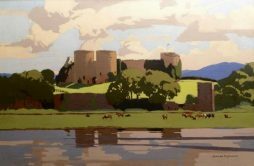 Darnley Fine Art are members of BADA, LAPADA and CINOA. 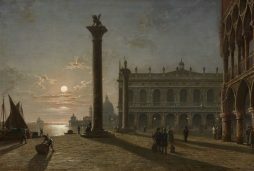 Pether’s lively sense of Venice as a great outdoor theatre is reflected in his shimmering brushwork, which invests the famous building of the National Library with an air of magic. Pether keeps a tension between the dark lines which define details of buildings and the entwined skeins of colour which evoke the rippling moon light playing across the lagoon, stone and figures. The light of the full moon is offset by the warm pink of the Doge’s Palace and local colours of the area outside. Typical of Pether is the composition with strong diagonals which give a dynamic sense of receding space. Here, Pether uses a personal technique, covering his canvas with blue before using a camera obscura to obtain exact shapes and perspective directly from real life. Pether was supremely competent in the technique of representing moonlight shining through cloud by the use of soft glazes over patches of dense paint. This view from outside the Doges Palace looking west towards the National library into the heart of Venice’s secular and religious power had been made famous by Canaletto in works such as The Bacino di San Marco on Ascension Day, c.1733-4 (Royal Collection). In the middle of the painting are the columns of St Theodore, the original patron saint of Venice, and St Mark, which then lead the eye through them into the distance to the San Giorgio Maggiore. Pether delights in the complex, fourteenth century gothic façade of the Doge’s Palace, symbol of the city’s extraordinarily resilient republican government. The painting is from the artist's mature period which was doubtless one of the commissions flooding in from clients, many of them English, who were undertaking the Grand Tour of Europe. Harington Bird was a painter of animals, often in watercolour. Born on 23rd May 1846, he was destined for the Army but took up painting instead. He studied at The Royal Academy Schools and in 1870, aged 24, exhibited his first picture there. 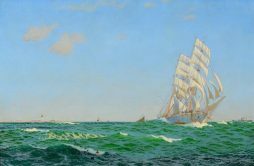 A second Royal Academy exhibit, ‘On Sufferance’, followed in 1874 before Bird set off for Montreal, Canada, where he became an Associate of the Royal Canadian Academy, but in 1885, after a ten year absence, he returned to England. Once back, Bird resumed his Academy career and seems also to have been engaged in commissions, painting prominent English racehorses of the time. Around the turn of the century, Bird started to concentrate on the Arab horse, and probably visited North Africa to study this noble animal in its natural environment. 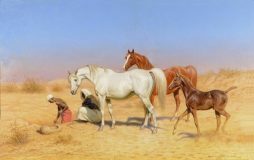 On the whole, Bird painted the Arabian horse in watercolour and achieved remarkable effects in this medium, capturing in particular the sheen of the horses’ coats and the dust of the desert. Bird’s meticulous attention to equine anatomy and skill as an artist make him the leading horse painter of the Orientalist movement. His work is to be found in many prominent collections, including The Royal Collection at Buckingham Palace. This painting is a rare oil, as he mainly painted in watercolour. The horses are depicted in profile, with the classical grace of a horse on the Parthenon frieze or a Stubbs. The pose conveys their elegant configuration, fine musculature and glossy coats. 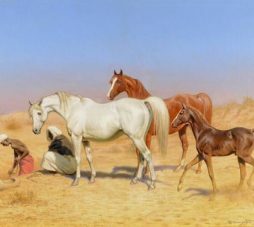 The desert setting is painted more broadly, as a strong backdrop in beautiful tones of blue with flecks of gold on the sunlit sky, so as not to detract from the visual impact of the powerful horses. The coats of the three horses draw the viewer in to these magnificent animals. Two of the main reasons western artists travelled to the Middle East was for the strong light and the brilliant colours, both of which Bird uses to full effect in this scene. 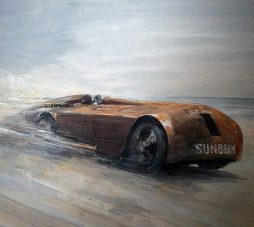 The Sunbeam 1000 HP Mystery, is a land speed record-breaking car built by the Sunbeam car company of Wolverhampton that was powered by two aircraft engines. 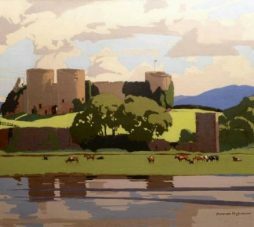 Rhuddlan Castle is a castle located in Rhuddlan, Denbighshire, Wales. It was erected by Edward I in 1277 following the First Welsh War. A popular tourist destination, it was ideal to use as a lure for people to travel to for their holidays.